Every now and then you meet someone and instantly know they are special. This is an amazing love story of a cat named Oreo and the woman he picked to be his mom. Oreo was famous for getting into mischief and compromising situations. You will laugh at his antics and keep wondering what he will do next! I am not a lover of animals, so I wasn't sure if I would love this book before I started reading the book. This is my first book about pets, especially cats. This is the story of the Author and her love for her pet Oreo. As if the cat has chosen Caralee as the owner, it grabs the hand of her from the cage begging her to take with her in Humane society. Even though Caralee's apartment will not allow pets, she cannot keep her thoughts away from Oreo. Oreo being a nice abused cat from her previous owner, Caralee feels it is her responsibility to adopt her. She takes the help of her aunt Natalie and adopts Oreo and brings the cat home to her apartment against her apartment leasing agreement. Thus their journey of togetherness continues making them inseparable. The writing style of the Author is very easy to follow and the words carry empathy and love. The author's intention to share her relationship with Oreo and spread love in this world is commendable. The title of the book is perfect and the cover compliments the same. The Author also shared some beautiful pictures of herself and her family with Oreo. As per the book, it seems like other family members like Natalie also love pets, which is great. It is lovely to see how they take their pets Daisy and Oreo for camping along with them. It was surprising that Oreo is strong and makes friendship with Daisy even though Daisy is a dog. This book makes us realize that some bonds are bound to happen and some relationships stay alive our whole life. This is a quick read as it is only 122 pages. I would highly recommend this book to pet lovers. Even though the book is great, I felt boring to read a few chapters as it is monotonous and there are not many other characters and twists and turns to make it interesting to continue reading. I rate this book 3 out of 4 stars. 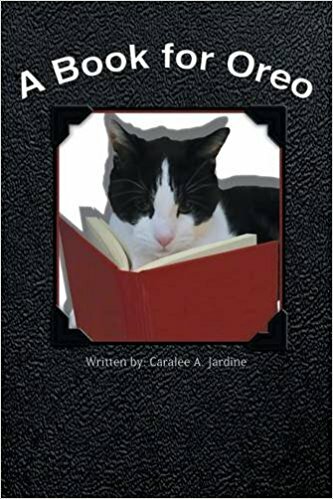 I give this rating as the author's writing style is friendly as if talking to a friend and the story emphasizes on love to Oreo who is such a sweet pet that any owner would love to have. I also realized, pets also can become a part of our family if treated with love and care. Moreover, they will be more loyal than family or friends. Caralee Jardine was born and raised in Calgary, Alberta. She has been in retail management for the past 25yrs and is currently running her family's outdoor power equipment business. From the time she was born she loved animals so its no surprise her first book would be about her most precious cat, Oreo. Since Oreo's passing she has adopted 2 more kittens, Gizmo and Bandit. Caralee is also a huge Mickey Mouse fan. Her favorite quotes from Walt Disney are "If you can dream it you can do it." and "Its kind of fun to do the impossible."